Adam Gatchel of Nashville, Tennessee is well aware of the power of a great pendant light. His Etsy shop, Southern Lights, is stocked with great finds that can enhance your decor... as well as become mini conversation pieces. 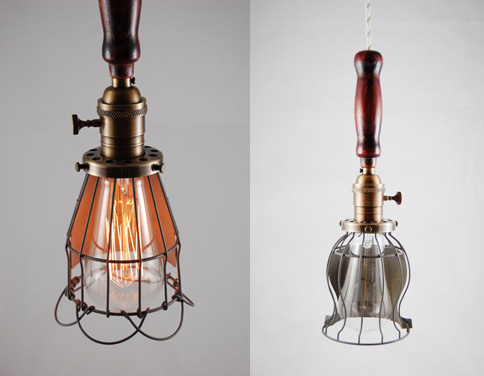 These are quality made, vintage inspired pendants with the added appeal of an edison bulb. I especially love the above pendant. As Adam explains on his site, "This is a beautiful vintage Hemingray glass insulator used sometime between 1920 and 1950 to protect telegraph and electrical wires." This is the clear version, but he also offers a similar style in blue. These pendants have a salvaged cool swagger. I like how they demand attention without having to be the center of attention. Find the Werthan, featured left, here and the Marathon here. This is the Hillsboro. As Adam shares, "This simple yet elegant pendant light is a dramatic way to showcase a carbon flamer bulb." Peruse his online shop to see all his illuminating pieces. And know that he is happy to customize orders as well, just drop him a line. Thanks Adam.